In 1930, Milwaukeeans wishing to see a movie had their choice of 89 movie theaters. They ranged from modest neighborhood movie theaters like the Grand on Holton Street to “movie palaces” – dazzling cost-is-no-object cathedrals of motion pictures. The Oriental Theater on Farwell Avenue is a surviving movie palace. Less known is the 1,300-seat Zenith Theater at 2498 W. Hopkins St. It survived largely because of a traveling faith healer, whose colorful antics captivated – and occasionally angered – Milwaukeeans. In 1953, the Rev. Adolpho Clarence Valdez Jr., a Pentecostal minister, came to Milwaukee to conduct a 10-week revival crusade in the city auditorium. It was his first visit and he liked what he saw. Milwaukee, he told a local newspaper, is slow to do things but when the city does act, it acts in the best interests of all. 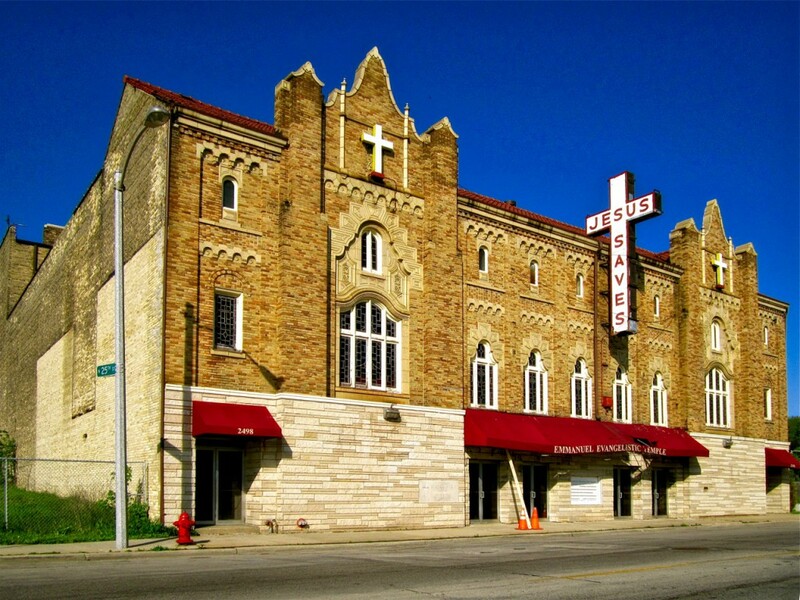 Returning in 1954, Valdez bought the Zenith Theater for $110,000 (nearly $1 million in today’s money), spent $70,000 on renovations, installed a new cornerstone (inscribed with his own name), and reopened the vast former movie palace as the Milwaukee Evangelistic Temple. Built in the mid-1920s, the Zenith was the only movie theater designed by local architects LaCroix & Memmler. Independent theater owner Edward Maertz claimed to have spent today’s equivalent of $6 million on his Zenith. That may have been an exaggeration, but there is no denying his theater is beautiful. On entering the building, one first passes through a narrow ticket lobby, then into the grand lobby, also fairly small (candy and popcorn sales were less important in 1928). This lobby once contained a fish pool and fountain. It still features a flying staircase, gracefully ascending into a well in the ceiling to reach the balcony lobby above. 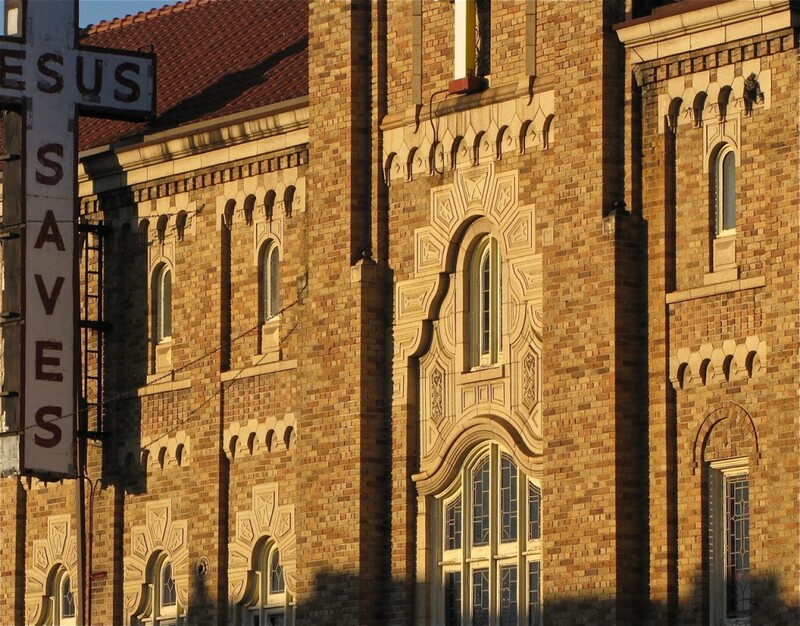 Art glass, elaborate tile and mosaic works, and ornamental iron are extensively used throughout the building. Behind the scenes, the building was just as impressive. A true theater, it had a stage, dressing rooms, and a lofty fly tower with ropes, counterweights, and pulleys to raise and lower set pieces. In addition to a full set of velour stage curtains, the Zenith had an asbestos curtain for added fire safety. The Zenith Theater, with its sidewalk retail spaces and basement bowling alley, served the north side until its 1954 purchase by Rev. A.C. Valdez Jr., a California native whose family’s roots go back to the original Spanish settlement of the West Coast. The son of a prominent Pentecostal preacher, Valdez worked as a tent evangelist from the mid-1940s to early 1950s. It wasn’t an easy life. Storms sometimes knocked down the circus-style tent, and he had 20 tons of equipment to set up, tear down, and transport from city to city. But the young Valdez had a flair for self-promotion. He was nicknamed “the flying evangelist” for his practice of flying a small aircraft over towns where his meetings were scheduled and dropping leaflets or soft rubber balls printed with information on the approaching revival. Having established a name for himself as a faith healer, Valdez gave up the tent and partnered with other prominent Pentecostal ministers in jointly renting auditoriums for weeks-long crusades. But faith healers like Valdez were controversial. Milwaukee didn’t quite know what to make of Valdez. Colorful and charismatic, he quickly built a congregation of nearly 1,000 members, all of whom were expected to contribute 10 percent of their income to the church. A “miracle service” was the highlight of each Sunday afternoon, with long lines of people shuffling toward Valdez to be healed. Valdez always said he wasn’t personally able to heal, he only prayed for healing and sometimes God answered the prayer. He also freely spoke of the times he needed more-earthly medical intervention, including operations to remove an ailing gallbladder and an emergency surgery for a burst appendix. “I tell our people that if prayers don’t work for you, then get the best doctor you can find. God put doctors here for a purpose,” he told a newspaper reporter. Valdez knew he had to be careful about healing claims. Wisconsin law has harsh penalties for non-medically trained individuals claiming to treat ailments. State statutes do contain a religious exception for Christian Science practitioners – but not Pentecostal preachers. At various times Valdez was investigated by the board of medical examiners, the Internal Revenue Service, the Milwaukee County district attorney’s office, the police vice squad, and the Better Business Bureau. None of the many investigations found cause to criticize Valdez’s practices or financial dealings. Dark-haired and slightly pudgy, Valdez was rarely at a loss for words. When critics denounced him for driving a top-of-the-line Cadillac, Valdez replied evil people may own expensive cars but that didn’t mean luxury is denied to the good. By the late 1950s, Valdez was flying high. He had a regular program broadcast on WMIL radio. Rev. and Mrs. Valdez also appeared each Wednesday, Thursday, and Friday at 8:30 a.m. on WISN-TV. 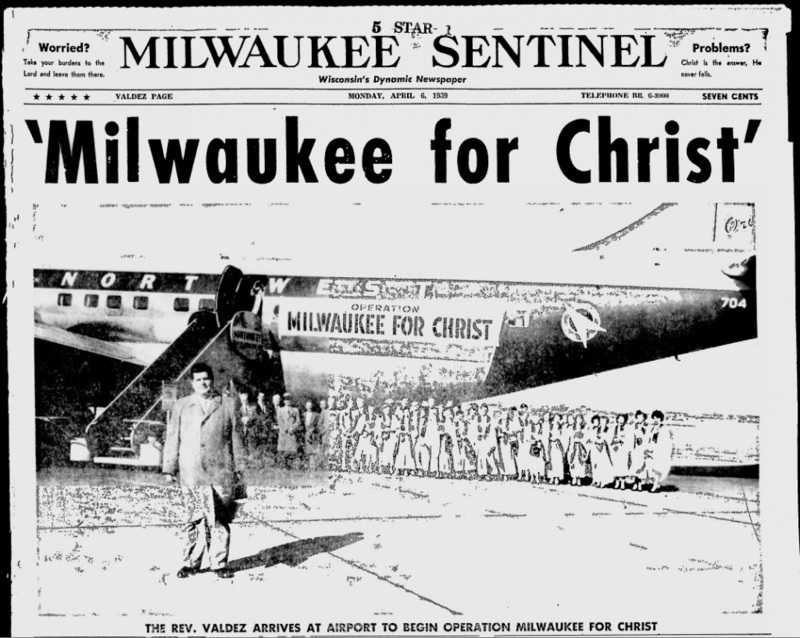 On April 5, 1959, Valdez kicked off “Operation Milwaukee for Christ” by taking to the skies in a chartered Northwest Orient Airlines Boeing 377 Stratocruiser. As the big airliner circled 16,000 feet above the city, Valdez spoke via a broadcast hookup over WMIL radio, and the church’s 50-member “airborne choir” provided musical accompaniment. Operation Milwaukee, Valdez explained in a full-page ad in the following day’s Milwaukee Sentinel, involved teams of volunteers going door-to-door to urge residents to attend the church of their choice regularly. Naturally, people with no church affiliation were encouraged to visit the temple where services were held each night and twice on Sunday. The temple’s membership reached 1,300, but behind the scenes, troubles were building. In 1970, Valdez made a startling announcement. He was returning to his former life as a traveling revival preacher and control of the temple had been handed over to Rev. R.W. Culpepper. A few months later, Valdez filed for bankruptcy. He listed assets of just $1,892 against debts totaling $8,697, mostly owed to credit card companies. Shortly afterward, on Oct. 29, 1971, Valdez died of a heart attack in Phoenix, Ariz. He was 55 years old. 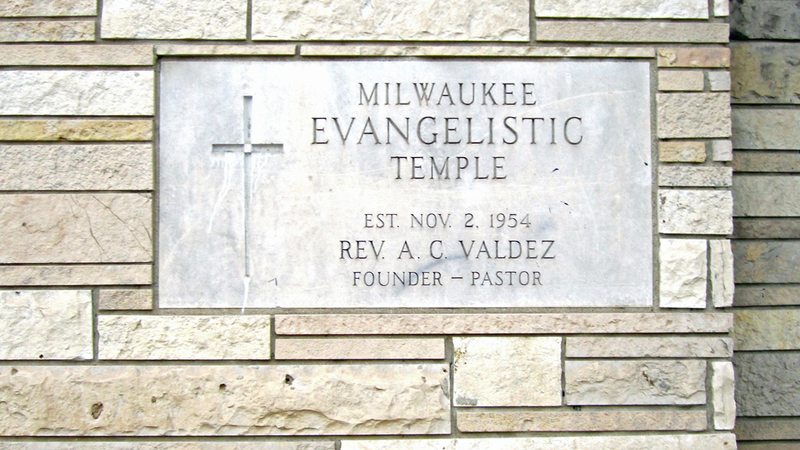 The Milwaukee Evangelistic Temple continued to operate. Rev. Culpepper and wife Barbara (they jointly presided over church services) told the Milwaukee Sentinel in a Feb. 20, 1976, article the church was nearly bankrupt and sagging under enormous debts when they took over. 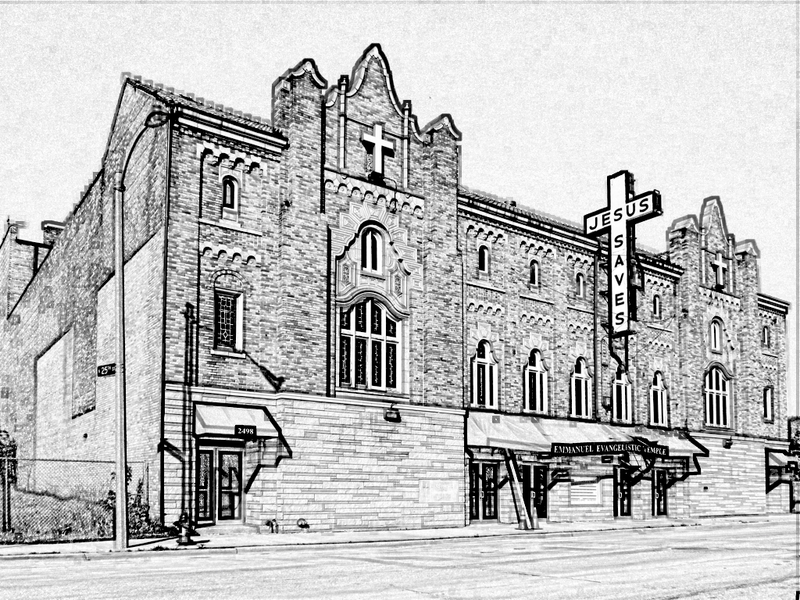 The 1976 Milwaukee Sentinel article described a typical Sunday service. With temperatures around zero the day a reporter visited, a mixed-race audience of 200 were in attendance in a building able to seat 1,300. The paper added that two collections are taken, a regular collection with ushers passing the plate and, later in the 90-minute service, a “love offering” with the Culpeppers themselves handling the task. Veteran churchgoers told the reporter that sometimes there is a third collection. After the service, the 1976 story continued, many families stayed for “a simple but hearty” $2 dinner in the church’s 11,500-square-foot basement event hall. Others brought in lunches from home and ate at long tables in the space that had once been a bowling alley. They planned to make a day of it, staying for the afternoon service, which was still devoted to healing the sick. The building, a rare surviving example of the golden age of Milwaukee movie palaces for sale was listed for sale recently. The present status of the building is unclear. I remember driving past the zenith when it was still a theatre in 1954, when we moved out in the “country” to Granville from my grandma’s home on North 19th Lane, off of Walnut St. In Milwaukee when I was very young. The Zenith was my neighborhood theater as I grew up. To my eyes, the “stars” in the ceiling were magical. Thanks for bringing back the memories. Good informative piece. Would have liked to see some pictures of the interior however with the building closed not likely to happen. Although you do provide good photos for your articles when possible. I enjoy your blog. Thanks Bob! I would love to see inside the theater. In case you’re interested, page three of this pdf property flyer has several current interior views, including what I suspect is the former bowling alley turned fellowship hall. The interior seems to be in OK shape. Thank you Bob for the excellent work you did on this great old theatre. I can still remember how beautiful it looked, when it was all lit up and glowing when we drove past it at night in 1954 !! I always love reading your stories and seeing the old Milwaukee photographs. Just north of the Zenith Theatre, there used to be a Milwaukee bus terminal, located where Hopkins Rd. and 27th Street intersected ,by the A.O. Smith Company. And another oddity directly north of the terminal , was a small private home that was converted into a bar. It as aptly named “The Bungalow Tavern” which was directly across the street from A.O.Smith’s main gate , which was a favorite ‘and all to convenient’ drinking establishment for it’s workers ! . The property was later purchased by the company and the little tavern was raised. Thank you for sharing your wonderful memories! Reading about the old movie theaters is fascinating and brings back many good memories. I was born and raised in Fond du Lac and I especially remember when the Lake Park Outdoor Theater opened in 1950 only a couple of blocks from home. I was 11 years old at the time and we walked to the movies. They had an tented area in front of the projection booth/concession stand and we were able to sit there in patio chairs and watch the movies for 9 cents. They also had a KiddyLand with a merry-go-round and a miniature train giving free rides. There also is a nice photo of the Beer Hut on that webpage. My mom worked there in the mid-1930s before she got married to dad.